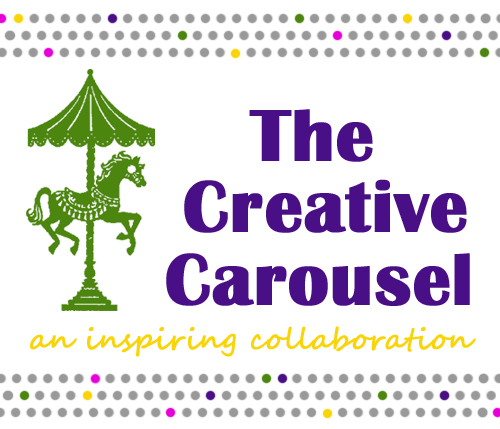 The Creative Carousel is back! 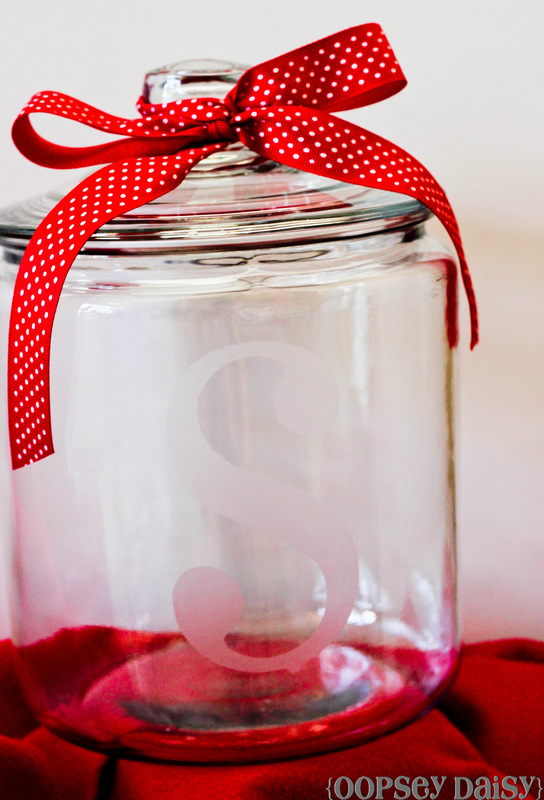 I am so excited to share some Valentine's Day-themed inspiration today!! As you know, I adore felt and have plenty left over from my quiet book and countless other projects! Well, it's making another appearance today! 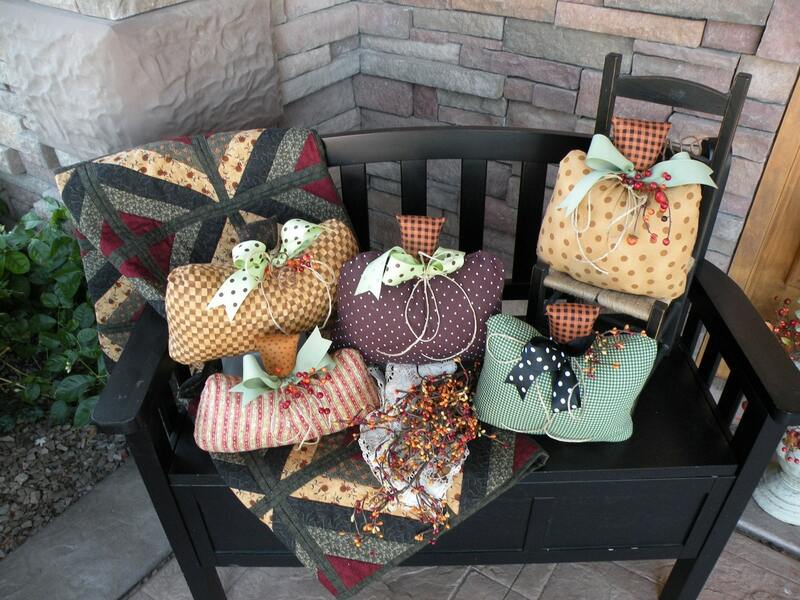 I first spotted similar chair pouches at Sheek Shindigs, and knew I wanted to create my own! These will be our own little Valentine's Day mailboxes. These were really quite simple to put together! I sewed all 3 pouches for our family in an afternoon. So let's get started! 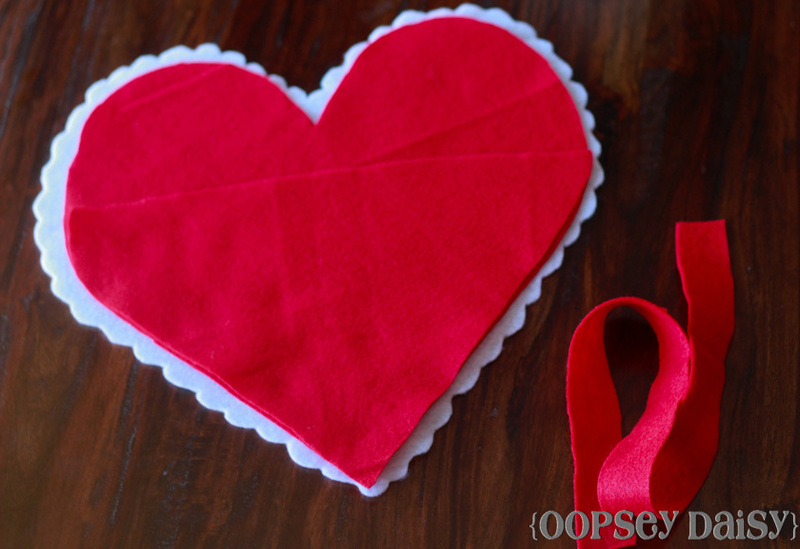 To start, I created a heart pattern from freezer paper. 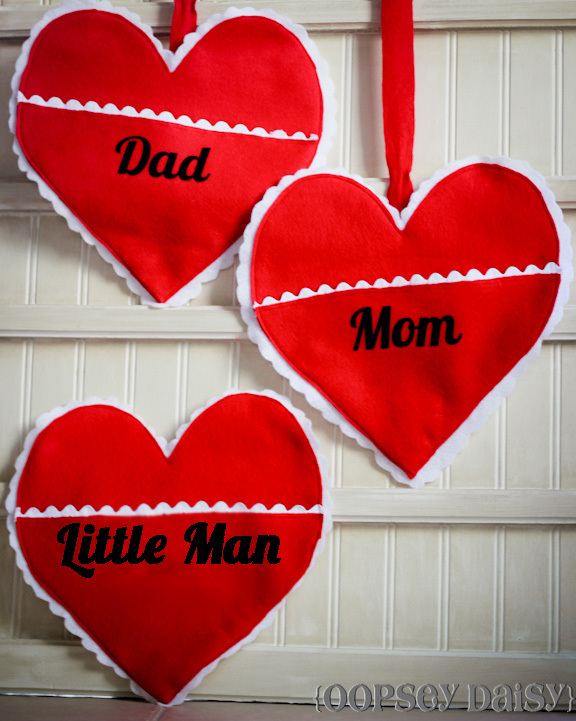 If you would like to use the same pattern, just click here to download mine. I did resize the pattern so it would fit a 12x12 sheet of paper. 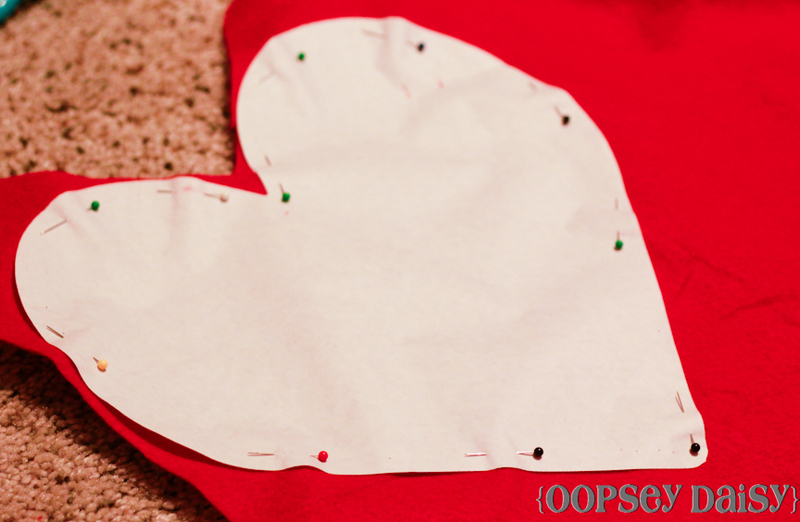 After creating the heart, I pinned it to white felt and just cut out the scalloped heart (the back) by hand. I also cut out a second red heart and chopped off the top to create the pouch. To hang the pouch on the chair, I cut a long strip of felt about 19 inches long, but this was custom for our individual kitchen chairs. This month's Creative Carousel is hosted by Amanda at Every Creative Endeavor. 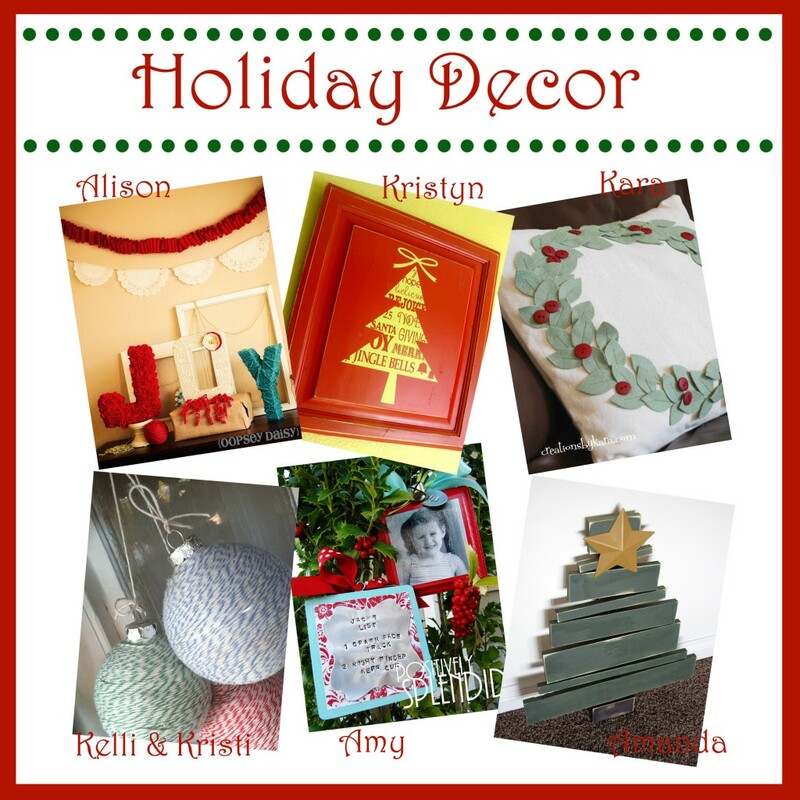 Every day this week, you will find some incredible creative tutorials-- all centered on holiday decor. 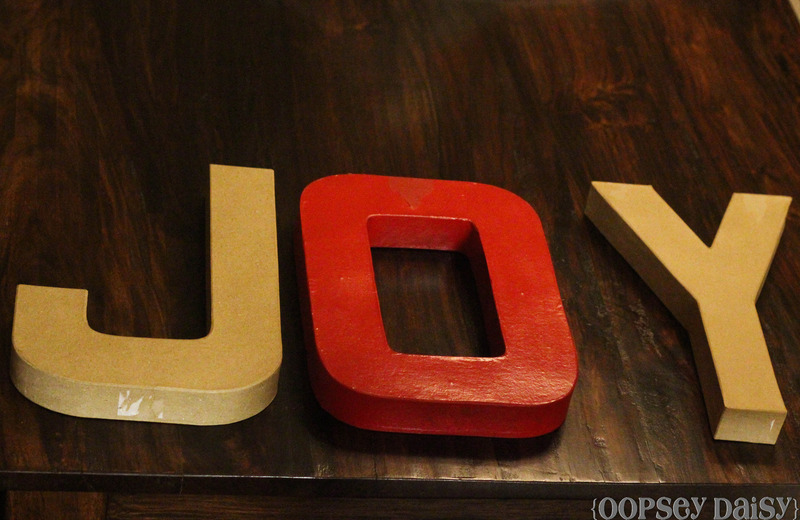 For my project, I created this JOY-ful Christmas display on my mock "mantel". I miss having a mantel. Our home doesn't have a real mantel--just a high ledge... A ledge so high that I have to get a chair and stand on my tiptoes to decorate. But I do love decorating the top of my DVD cupboard! 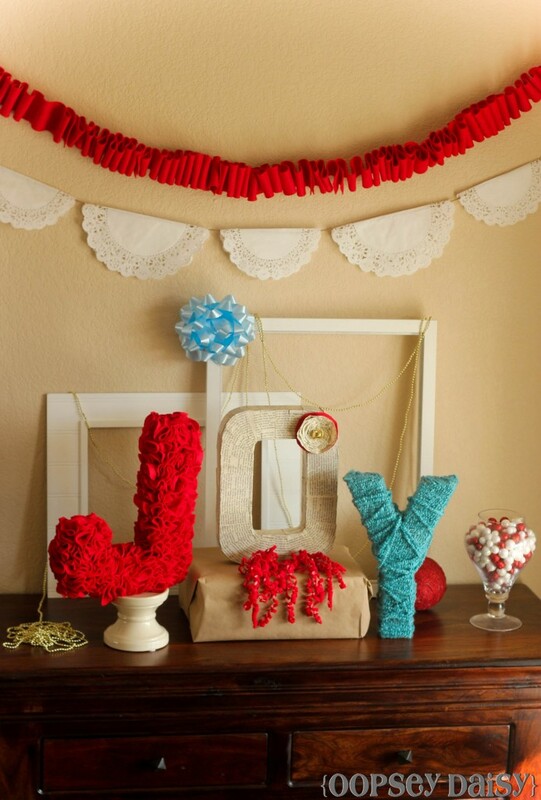 I have always loved the red and aqua color scheme for Christmas, so I set out to create a happy, colorful display to welcome in the holidays. 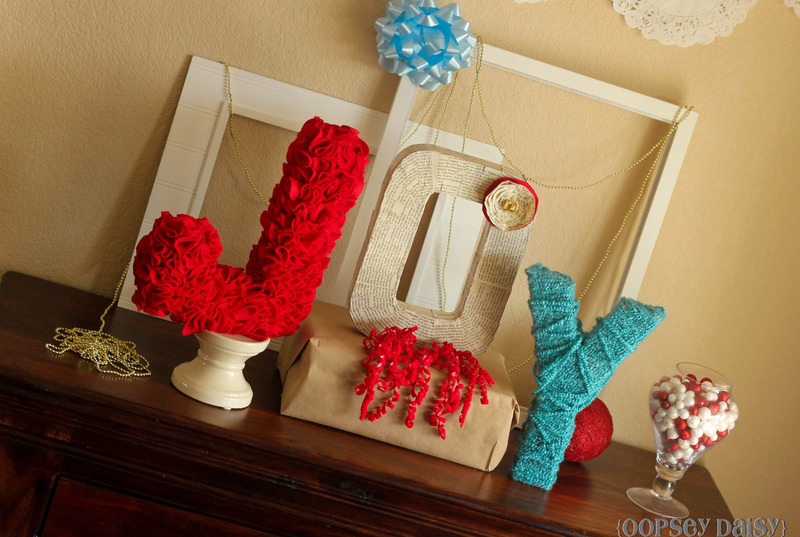 I started out with these large letters from JoAnn's. I had the O from this P-O-P frame project! And I used coupons to purchase the other letters. I am proud to say I spent less than $10 on everything! Not bad! 1. I gathered some felt I already had on hand. I probably used close to 3/4 yard of red felt to completely cover this letter. 2. I put on a movie, and just started cutting out tons of red felt circles about 2-inches each. 3. I folded each circle in fourths and pinched the bottom point. 5. I love the texture of all that felt! 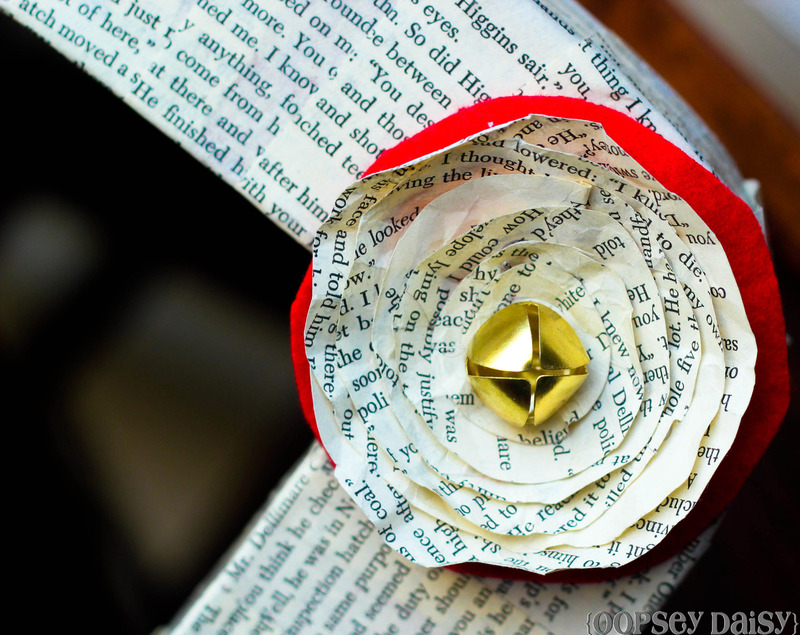 Doesn't it remind you of rose petals? Love. 1. For this letter, I grabbed an old book that I found at Good Will a year or so ago. I cut each page into strips about 2 inches wide. 2. 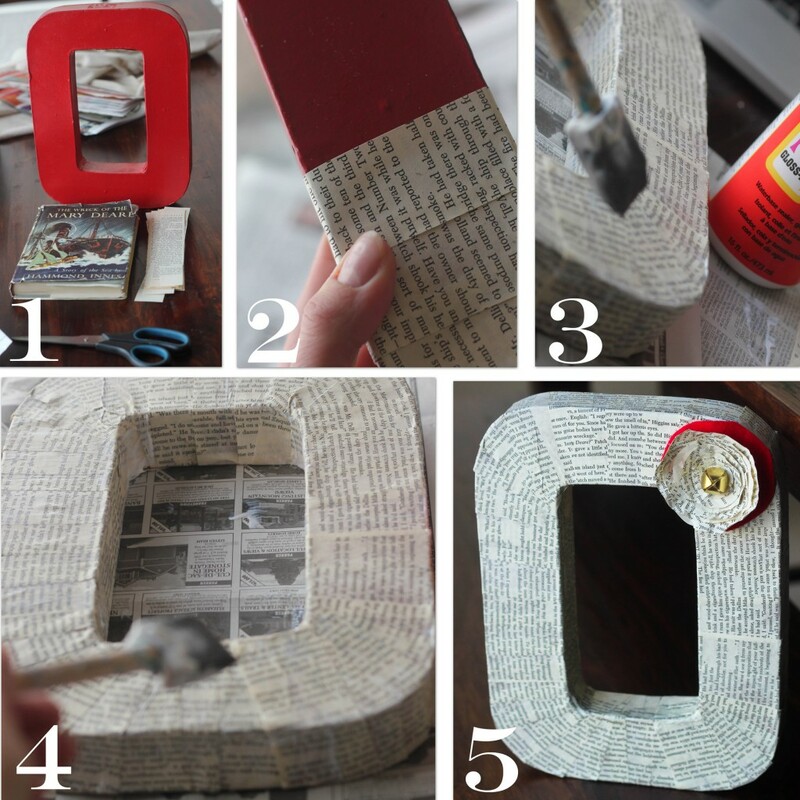 I used mod podge to wrap each strip around the O. 3. I gave the entire O a coat of mod podge over the top, too. 4. After allowing the letter to dry completely, I covered the other side of the letter, too. 5. I added a jingle bell flower in the corner! I think this is my favorite part of the entire project! Lucky for me, the Y was the quickest! I had it done in about 10 minutes! 1. I found some plush aqua yarn for this letter. I wanted lots of texture! 2. 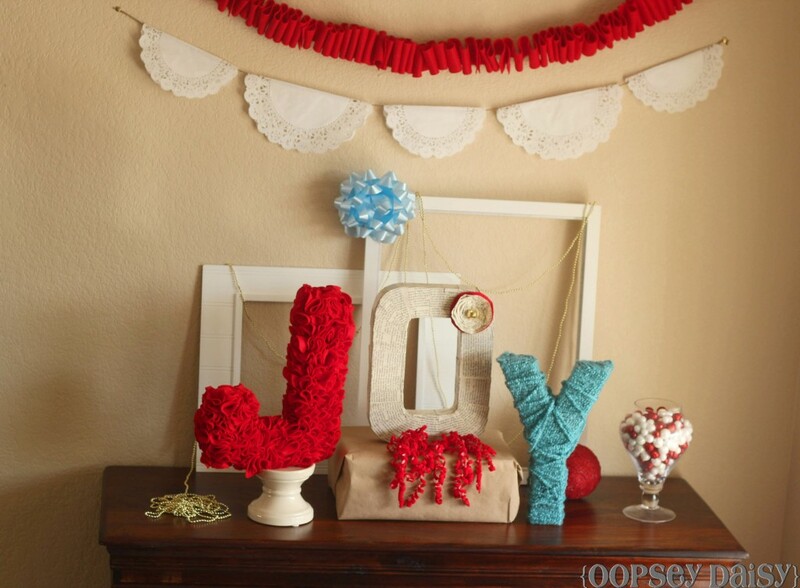 I used spray adhesive to adhere the yarn to the letter. I just wrapped it around and around, as tightly as I could. 3. Once I had wrapped the letter tightly with the yarn, I went over it again loosely to give it a messy look. I wrapped an empty box, found a spare frame (I used the frame and its beadboard matting), and threw in a few other random items! 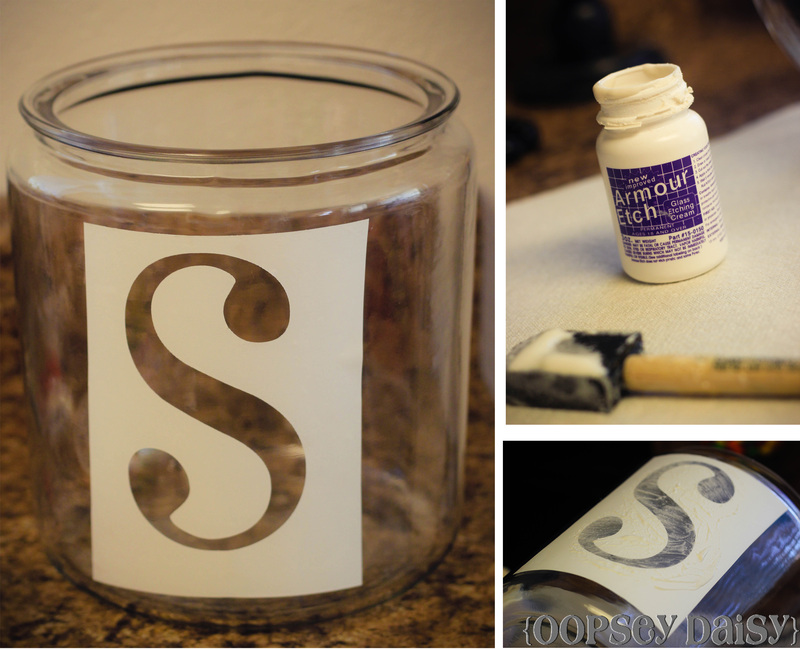 I wanted the letters at varying heights, so I used a candlestcik holder and wrapped an empty box to create levels. I have a lot of gold in my Christmas decor, so I thought the gold beads might tie in nicely! I created a few quick garlands--a paper doily garland along with a messy ruffled felt garland. I am so thrilled with how this turned out! This makes me want to drink hot cocoa and listen to Christmas music! 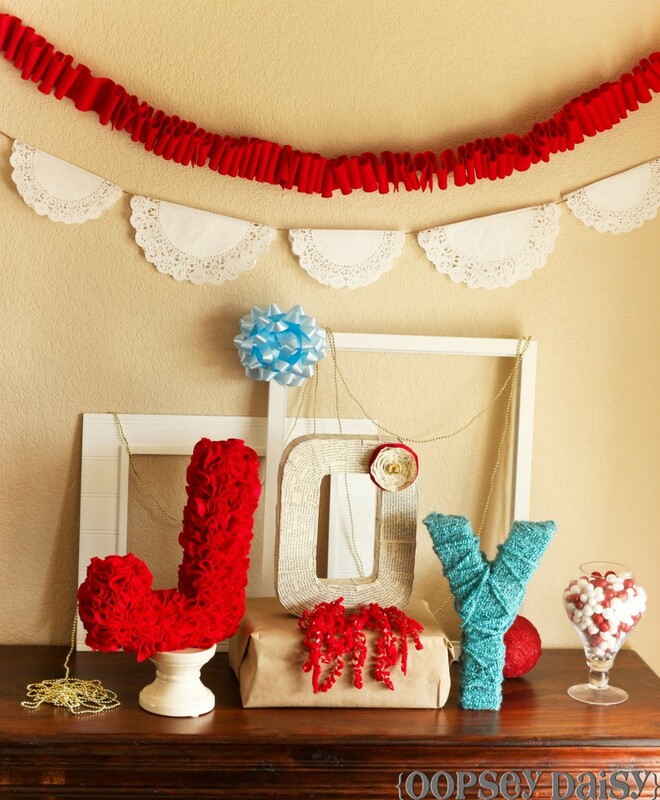 This is only the beginning of a whole week of fabulous holiday decor projects! Be sure and stop by Lolly Jane tomorrow for another fun tutorial! Every Creative Endeavor is hosting a huge giveaway with some incredible prizes. 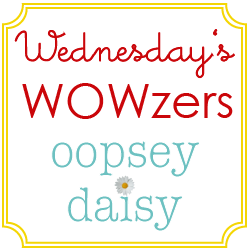 I would be thrilled if an Oopsey Daisy reader won! I am so stinkin' excited about all of the fabulousness in this line-up of sponsors! A big "thank you" for sponsoring our fun event! 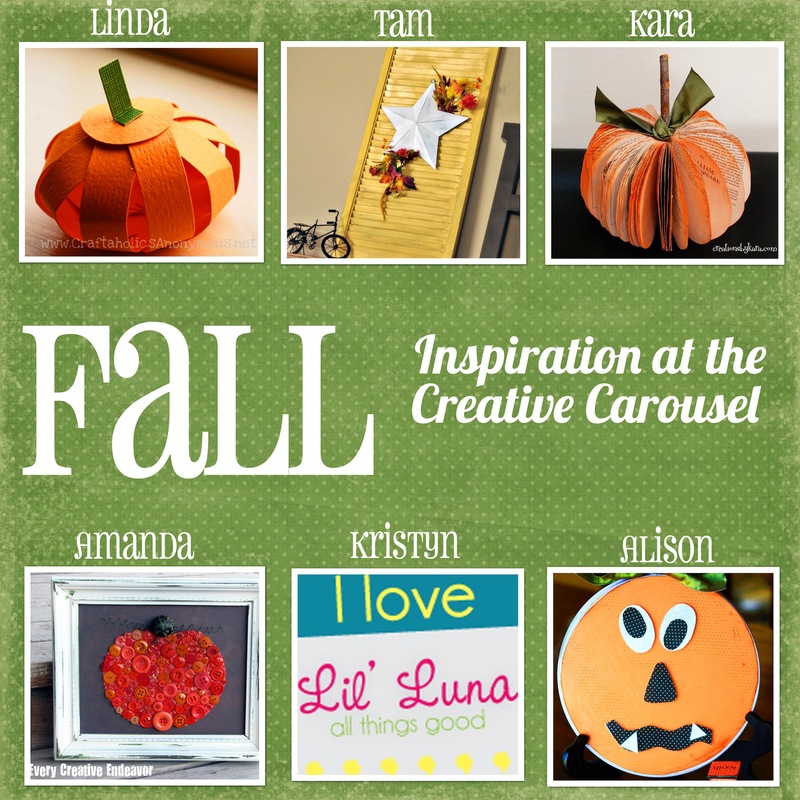 The October round of the Creative Carousel is here! I am so excited because this means an extra dose of creative inspiration! A group of truly fabulous bloggers (can you believe they allowed me to come along for the ride??) have joined forces to share some ideas centered on October's monthly theme "Handmade for the Holidays." The lovely Kara from Creations by Kara will be hosting this month. Kara is hosting a HUGE giveaway with some truly amazing prizes! As always, thanks to our incredible sponsors for making it all possible! Go here to enter to win some seriously CUTE stuff! Stay tuned for more creative inspiration! Has this been a fantastic week or what?! Honestly, I have been so inspired by a week packed full of fun fall tutorials!! 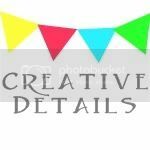 In case you missed out, please stop by these talented ladies' home blogs and check out their fall tutorials! 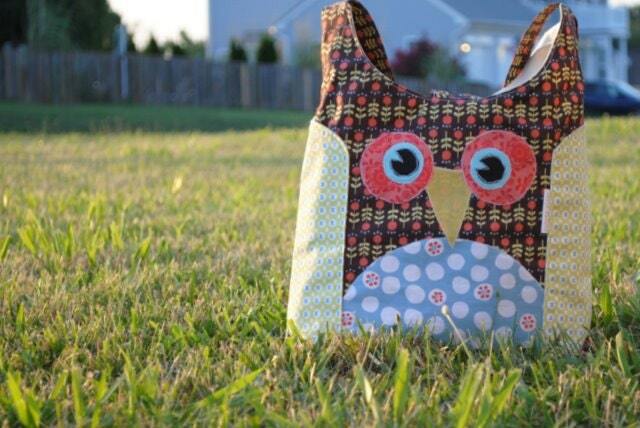 They have shared so much crafty goodness! 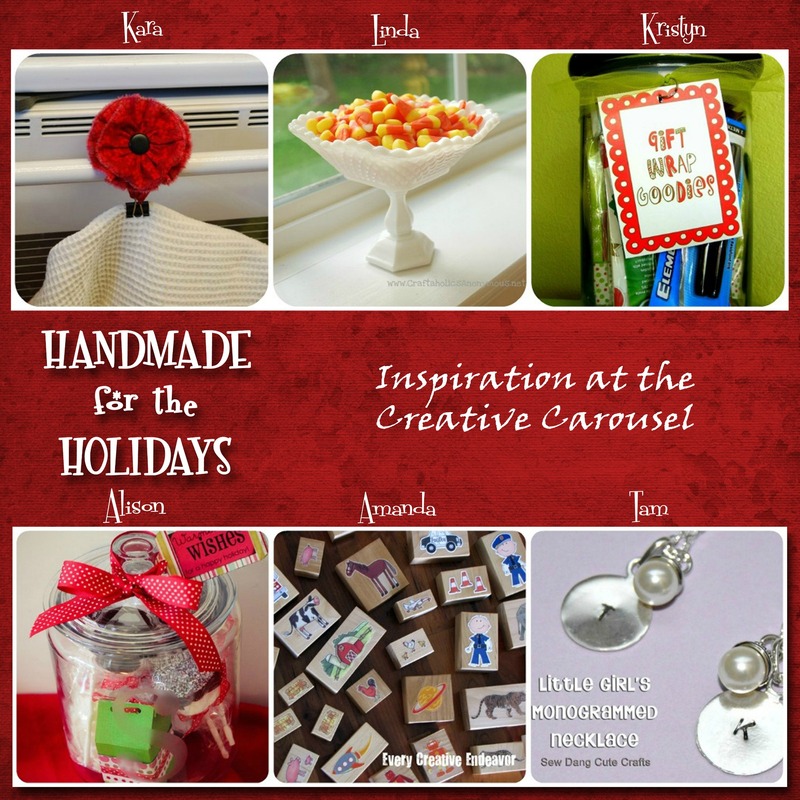 Now stay tuned for October's Creative Carousel, where Creations by Kara will be hosting a whole giveaway and tutorial series about Handmade for the Holidays. 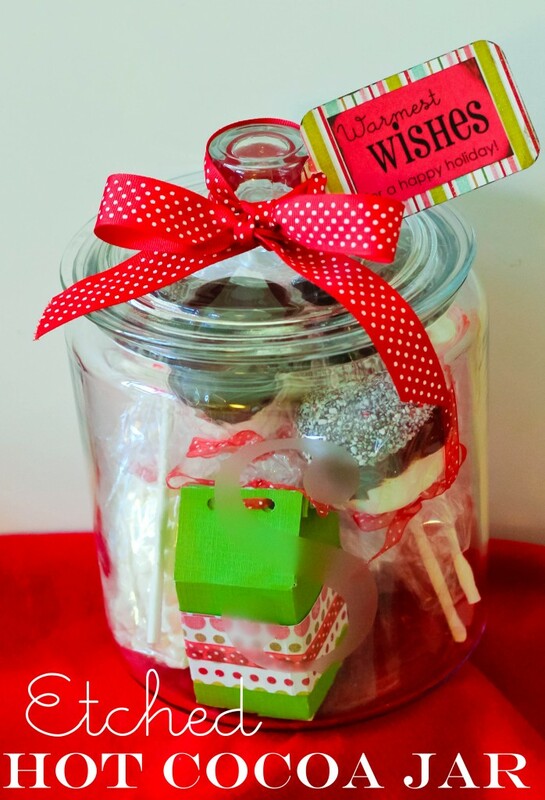 This will be perfect for me to get planning for holiday gifts! 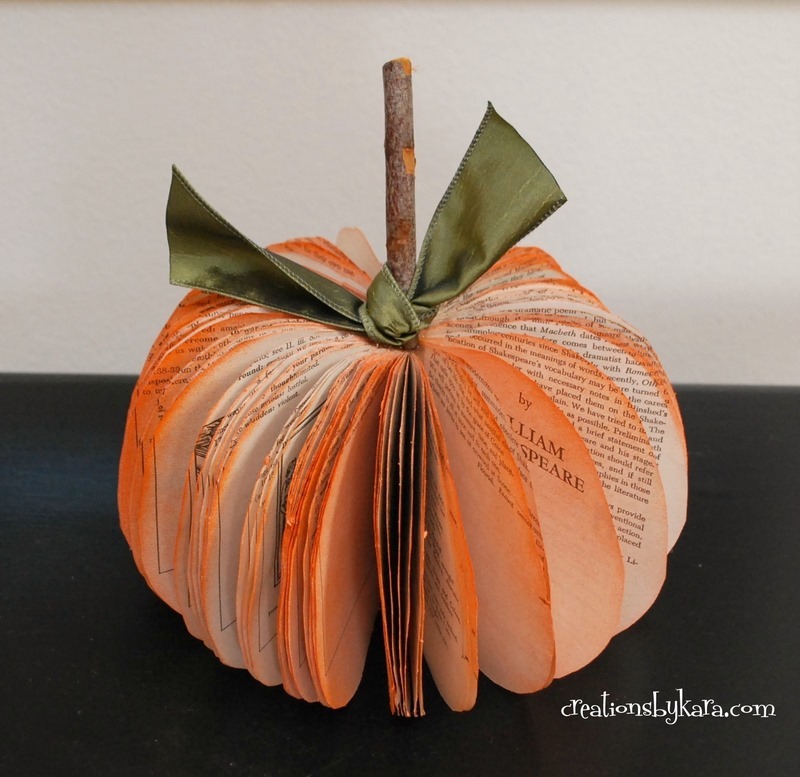 I so enjoyed reading all of your memories and favorite things about fall! What a fun giveaway!! Thank you soooo much for putting it together!! Fall is by all means my favorite season. 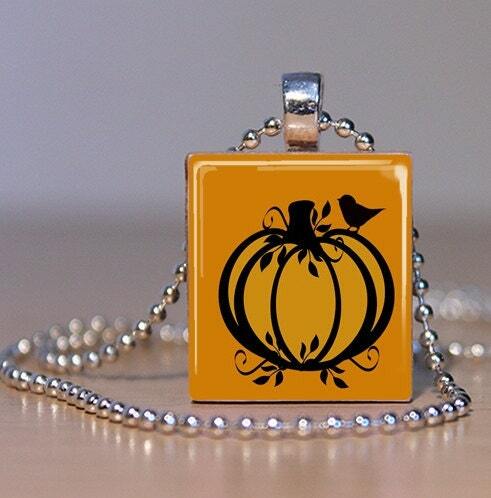 I love football, Halloween, pumpkins, soups and ciders, the cooler weather, jumping in the leaves and playing outside with the kiddos and fun family days. I’m also loving that my sweet baby girl is experiencing her first fall (she’ll be one in November) and I’m already planning all the fun things she and I, along with my 6 year old son, are going to be doing together. I love them so!! 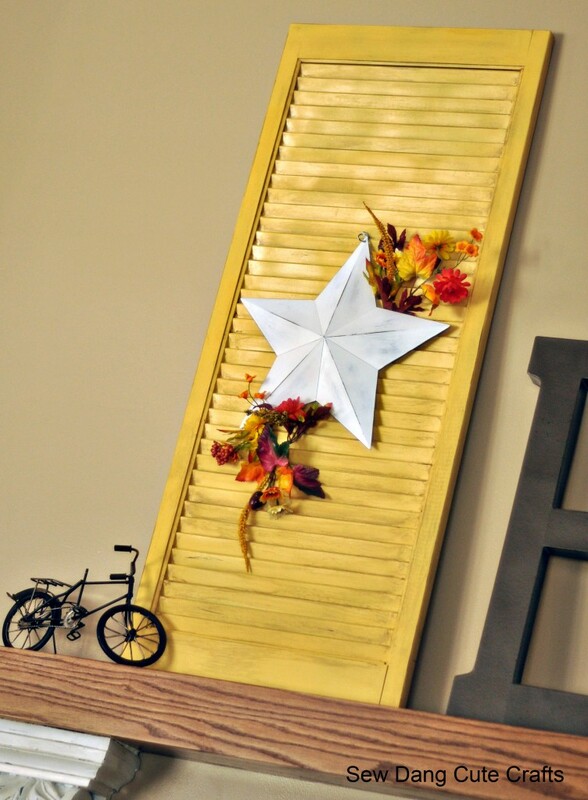 I am definitely in need of some festive fall fun stuff to jazz up the house…soooo crossing my fingers!! Thanks for the chance! I’m going to spread the news. Thanks for the great giveaway. I love decorating my house for Fall, taking my littles to the pumpkin patch, carving our pumpkins together, dressing them up for trick-or-treating and, of course, all the yummy foods that come with the season. Ladies, I will be contacting you SOON! 🙂 Check your e-mail! Thanks again to our AMAZING sponsors who made all of this possible. Be sure to check out their incredible blogs and shops! I hope you've been enjoying The Creative Carousel this week! Fall has really inspired me! As the temperatures have dropped just a few degrees, I have hit a huge surge of creativity. 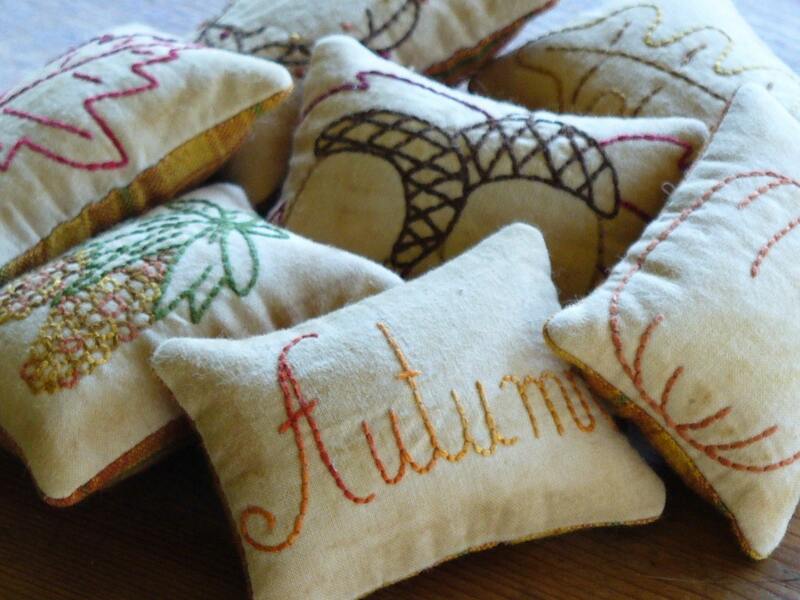 I am knee-deep in several fall projects! Today I decided to share the project that best defines me. No matter how hard I try to make something just for me--I am always so much more motivated to make a project that the whole family (specifically Little Man!) can enjoy! 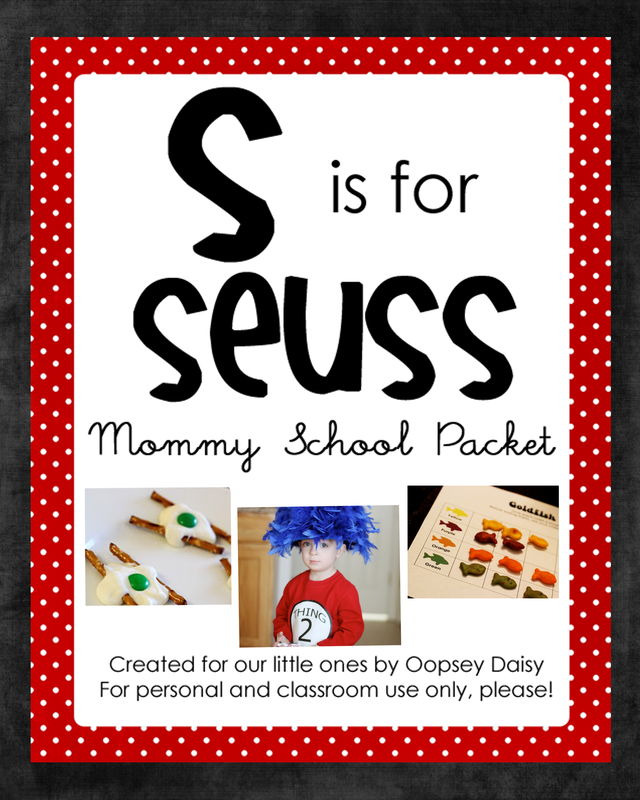 So once again, the Mom AND the Teacher in me have joined forces on this little project. 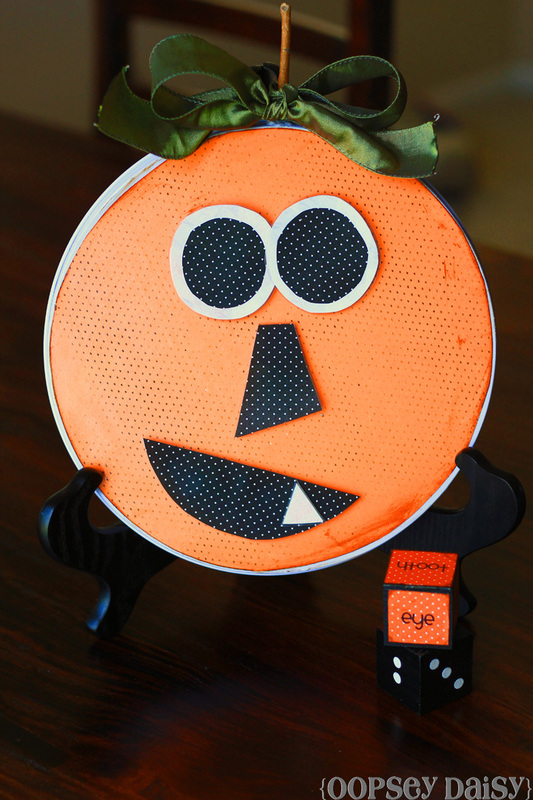 Let me introduce you to our brand spankin' new Roll A Jack-O-Lantern game! PLUS there are some downloads at the end of this post to help you create your own game at home. This game is versatile. You can adapt it however you would like for your own family! 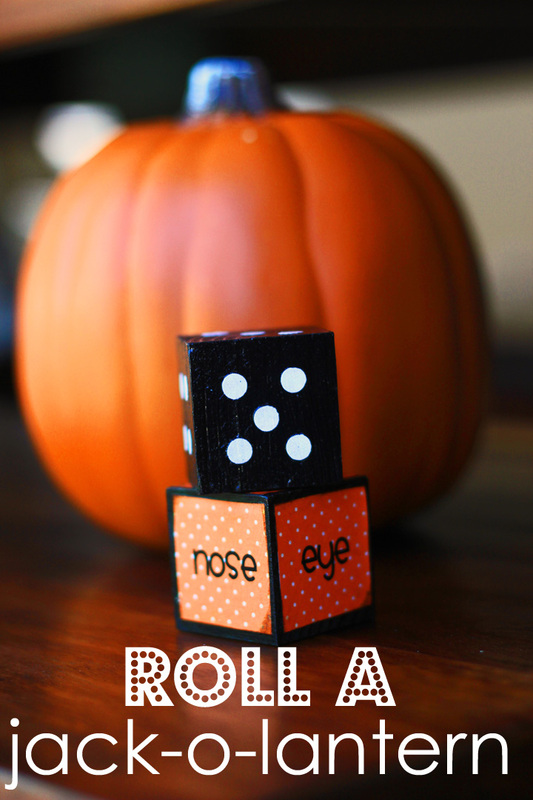 The idea of the game is to build a jack-o-lantern, with the help of the dice! 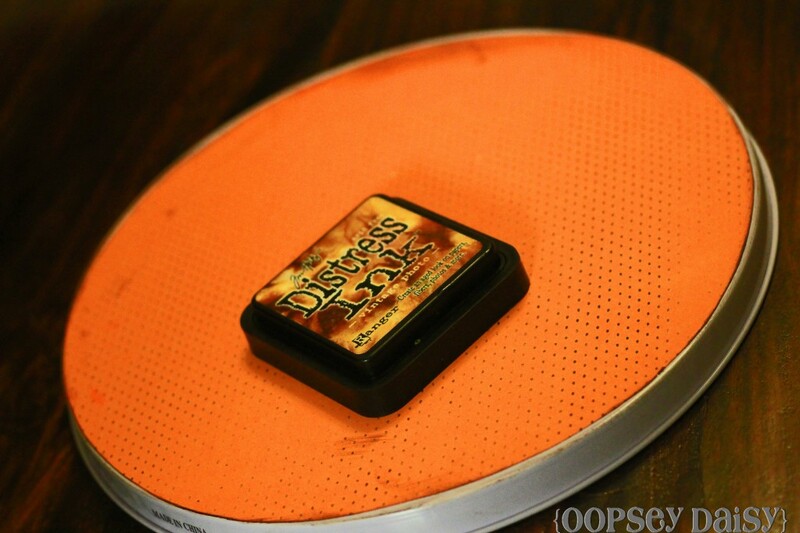 I started out with a $1 burner cover from the Dollar Tree. Yes, there was a rooster on it. But most importantly, it was magnetic! 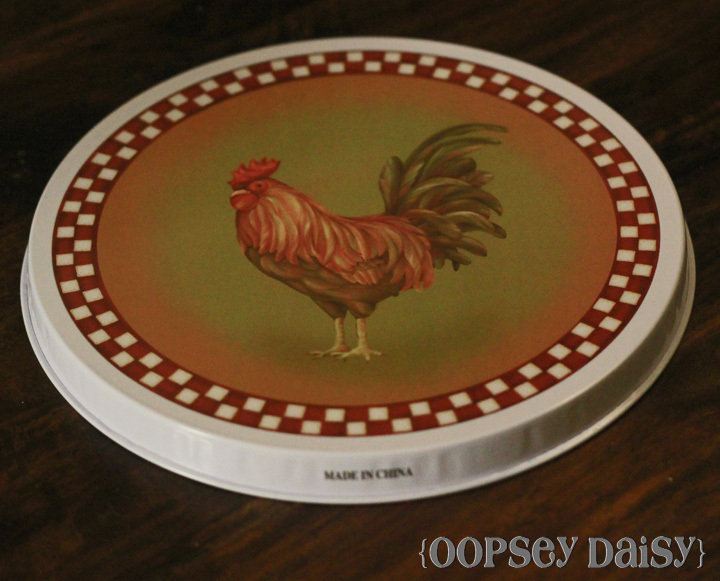 I quickly covered that rooster with some orange scrapbook paper. I added a layer of protective mod podge over the top (because it will be getting plenty of use! 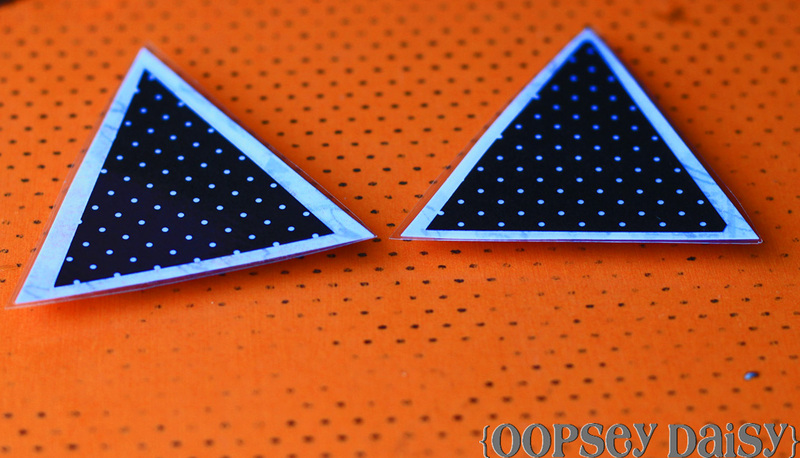 ), and distressed the edges a bit, too. Today is a day I have been SO excited to share with you! 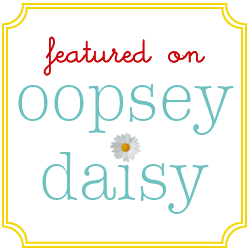 I am excited to announce a little something new at Oopsey Daisy. 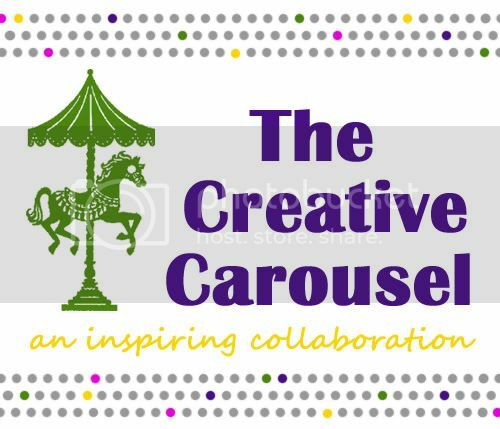 I am working with several talented bloggers on a collaboration event called The Creative Carousel. The idea is that we will select a theme each month. 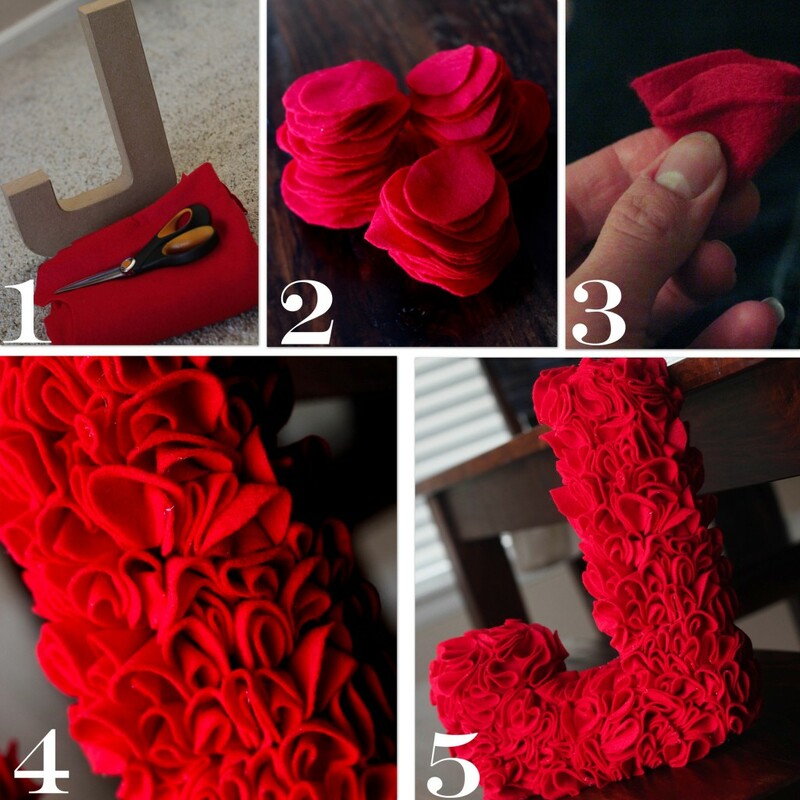 All week long, we will share tutorials revolving around that theme! Now the best part is that we are inviting YOU to celebrate with us. We have some seriously fabulous sponsors, and I am THRILLED to have them on board! Because these shops are full of creative goodness! 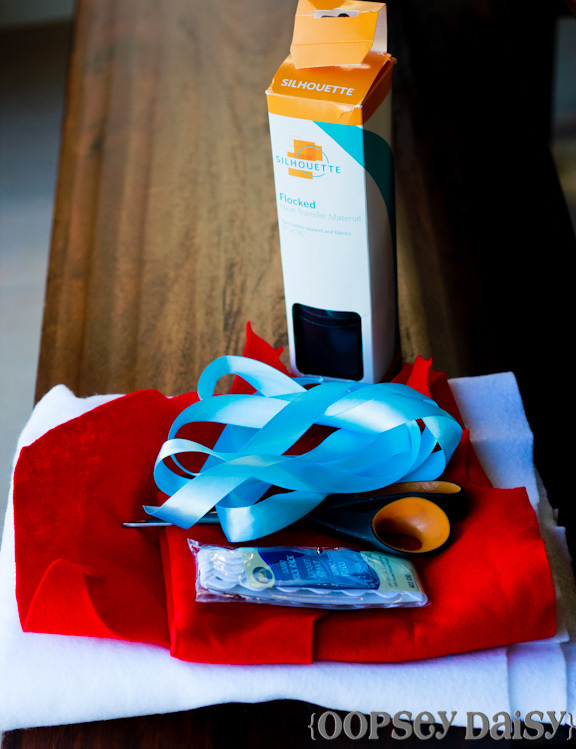 They are offering over $300 in creative goodies to help us kick off this fun event! We are so grateful for their willingness to be a part of this! We will have 2 winners, each receiving a humongo prize package! Are you ready for this?? 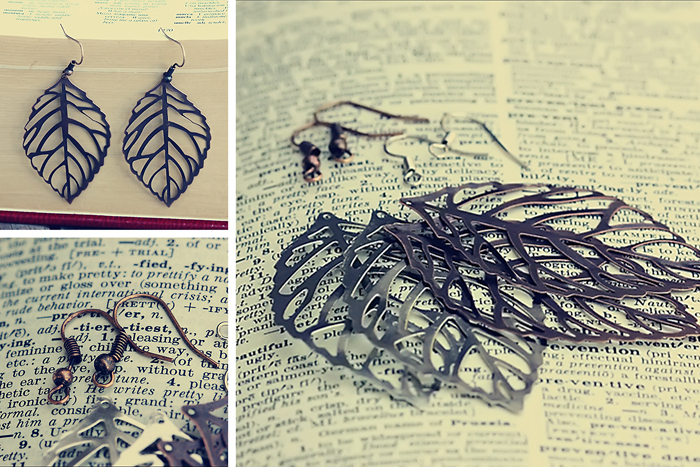 Chic set of leaf earrings from Pick Your Plum. There will be 2 winners, each winning their own incredible prize package! Here is how you can win! 1. Tell us what you love about fall. We want to hear it! Is is the goodies? Those fall sweaters and boots? Halloween or football? 2. Tweet about this giveaway, and be sure to use the hashtag "creativecarousel." This giveaway will remain open until Saturday, September 10 at midnight, and the winners will be announced along with my tutorial and Creative Carousel wrap-up on Sunday. 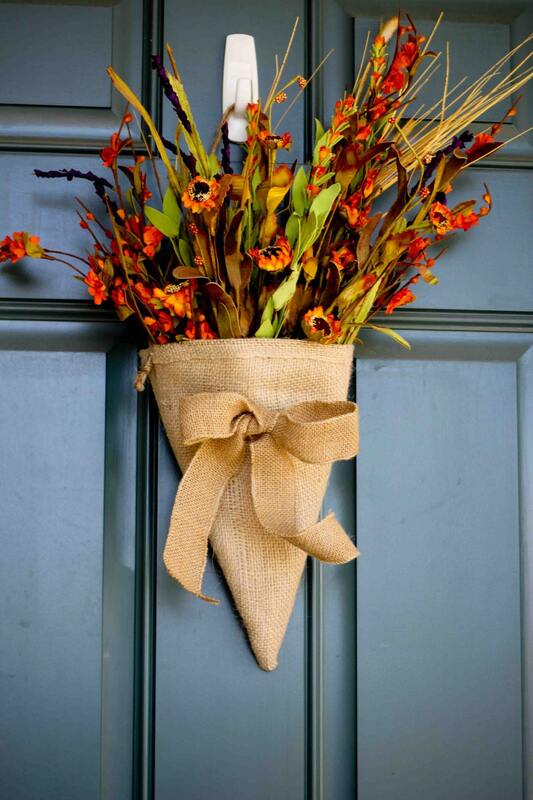 And stay tuned for a week full of fun fall tutorials! Thanks again to our fabulous sponsors!